Those of you taking a special interest in J.R.R. Tolkien’s life and works may have heard of Patrick H. Wynne before. He is part of the Elvish Linguistic Fellowship and “a member of a project to order, transcribe, and edit Tolkien’s unpublished linguistic papers.” That is, if you have ever heard of Vinyar Tengwar and/ or Parma Eldalamberon you know him and his work. To give you a hint how much fun ordering this calendar will be for you look at this picture. 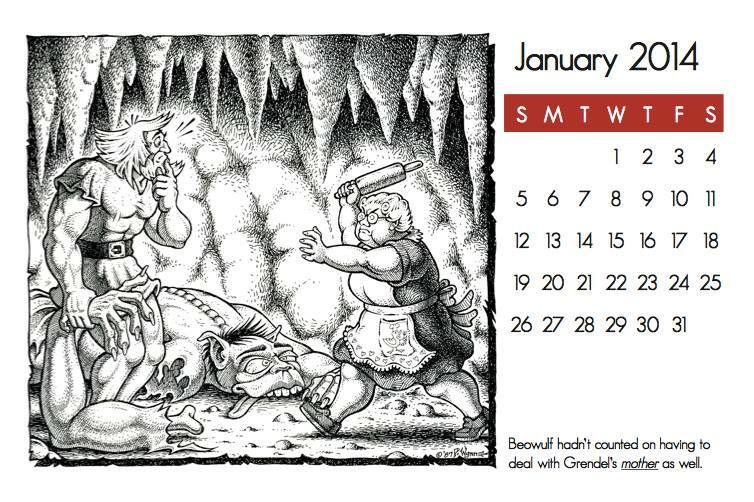 This is the January Calendar Page. Format: Desk calendar, 4 inches X 6 inches in plastic jewel case. Each replaceable calendar month is printed on photo-quality paper. Price: Calendars are $10 each, plus $5 standard shipping within US. For larger quantities, expedited shipping, and/or shipping outside the US, email your information and we’ll calculate the charges. To order, please email 2014patcal(at)gmail.com with “Calendar Order” as subject and inlude your shipping information and quantity, and we’ll respond with a confirmation and instructions for sending payment through Paypal. Visit the official calendar page for another preview month and any questions.